Print the pdf version of this material (with captions) and carry it as guide during your tour of Nelson’s cemetery. As with all the resources on this Website, permission is required prior to use or distribution from elsewhere. Nelson Memorial Park Cemetery is located in the Uphill area at the top of Falls Street. 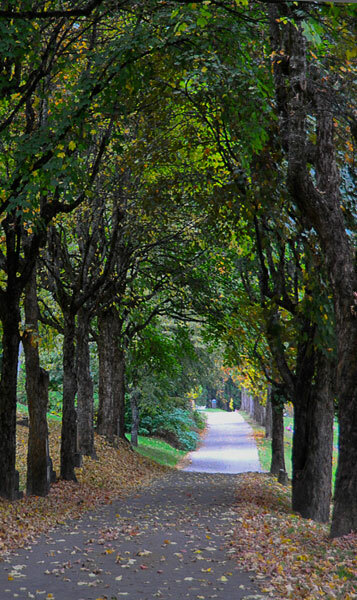 The cemetery occupies approximately 6 hectares (15 acres) of land accessed by beautifully treed service corridors that provide excellent strolling lanes past approximately 11,500 gravesites of Nelson’s most prominent and earliest citizens. For many years the population within this necropolis has exceeded that of the city it serves. All individuals interred in the cemetery contributed in some way to the development of the city’s character and charm. In most cases, women assumed the status of their husbands and their significant efforts were seldom recorded in the contemporary media; therefore, it was difficult to include them. It also was a challenge to select what gravesites to include; but the main selection criteria were: fame of occupant, gravestone, epitaph and proximity to the roadway. As you follow this tour please remember that the interred should be given the utmost respect. 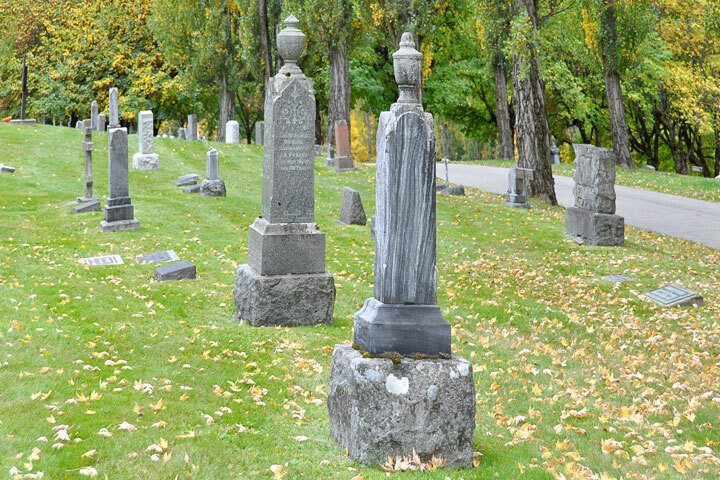 Conservation of the Nelson Memorial Park Cemetery is everyone’s responsibility, so please stay on the roadway and avoid tampering with the gravesites. Report any vandalism to the police. For further information, contact the Caretaker (weekdays in the cemetery office), the Cemetery Records Clerk, or the Nelson City Hall. Cemeteries reflect the nature and times of the surrounding community and are often the earliest form of planned landscape. 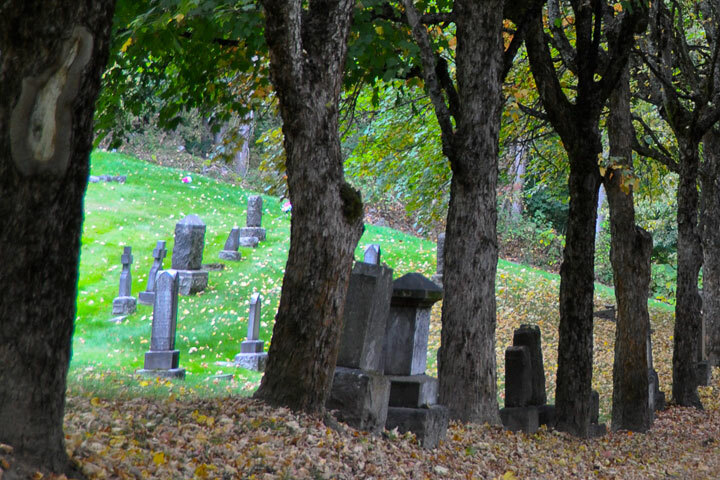 In the nineteenth century open garden–like cemeteries were developed outside city limits. Burial–grounds were transformed into peaceful, beautiful gardens to make the dead accessible to the living. These cemeteries emphasized the sanctity of the family, a sense of tranquility and a focus on public health. During this era public cemeteries traditionally permitted segregation by religious, ethnic or social association. 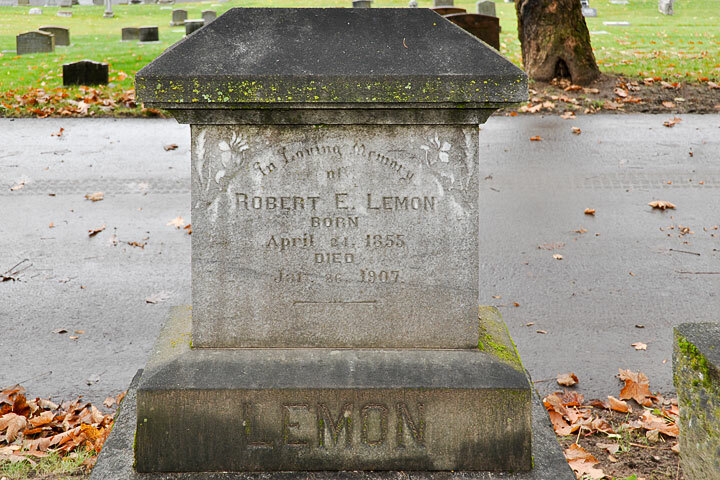 From the beginning in 1898 the Nelson cemetery was surveyed into different plots: Anglican, Roman Catholic, Chinese, and General (no affiliation), later followed by Knights of Pythias, Fraternal Order of Eagles, Independent Order of Odd Fellows (I.O.O.F. ), Masons, Soldiers, etc. Upright, elaborate monuments from this era gave way to the manicured lawns and almost invisible horizontal memorials of the mid–twentieth century. 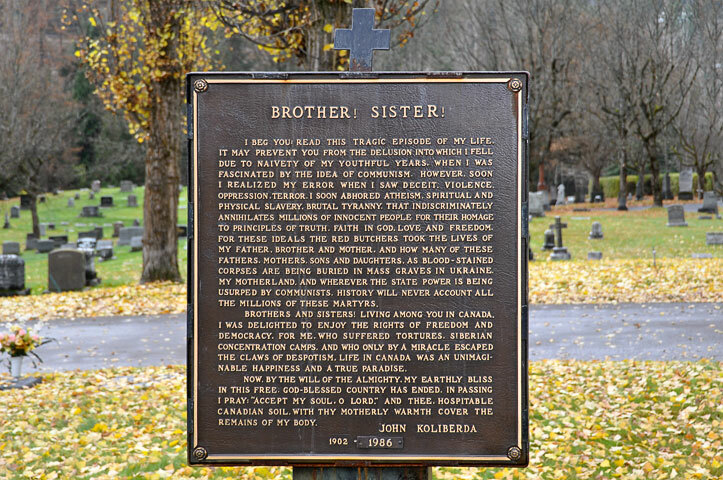 Therefore, the layout, design, symbolism of markers and choice of epitaphs reflect the changing customs and attitudes of a developing society. Note that, in keeping with a medieval Christian practice, the majority of graves and gravestones face eastward so that the deceased would view the rising sun on Resurrection Day. The first funeral held in Nelson was for A. Bart Henderson who probably died in early 1889 and was buried near Baker and Falls Streets on the western fringe of the downtown district. 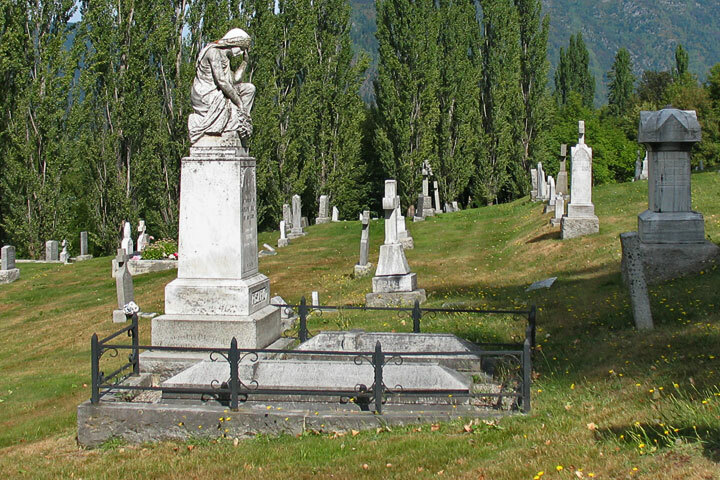 To extend Baker Street westward to the railway station, the provincial government allocated $48.00 in 1893 to remove and transfer three bodies from this first graveyard to Nelson’s second burial ground situated just east of the town in the vicinity of the current City Tourist Park on High Street. 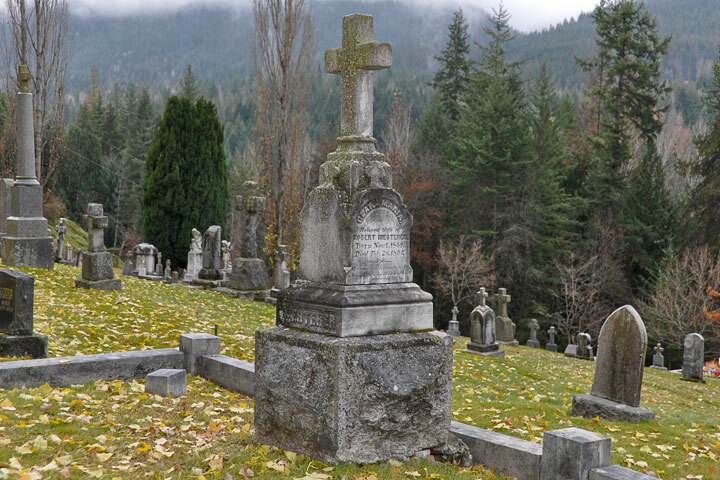 For a permanent cemetery site, 16 hectares (40 acres) of land just south of Nelson was purchased from the Columbia & Kootenay Railway Company, a subsidiary of the Canadian Pacific Railway. By the end of 1898, all bodies were removed from High Street and transferred to the present cemetery using the horse–drawn Resurrection Wagon. It could be argued that there was a fourth burial site in Nelson’s former jail yard located northwest of the courthouse. Convicted criminals, James Wood (1897), John Doyle (1898), and Henry Rose (1902), were hanged and buried in unmarked graves. Quicklime accelerated the disintegration of their bodies and, apparently, there was an excellent radish crop the following year! The City Hall/Provincial Government building and the adjacent parking lots now occupy this site. • No horses will be allowed to pass through the grounds at a rate faster than a walk. • Neither bicycles nor tricycles will be allowed on the grounds. • Drivers of carriages at funerals are required to remain in their seats, or by their horses, during the performance of funeral ceremonies. • No picnic party will be admitted to the grounds. • No smoking will be allowed within the grounds. • Dogs will not be admitted. • All persons are prohibited from writing upon, defacing, or injuring any monument, fence, or other structure, or any tree in or belonging to the Cemetery. • Any person disturbing the quiet and good order of the place by noise or other improper conduct, or who shall violate any of the foregoing rules, will be compelled instantly to leave the grounds. 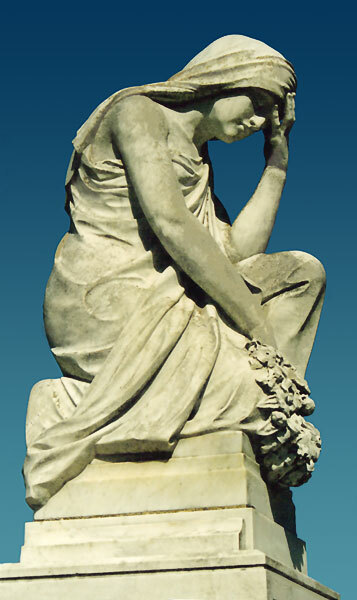 By the turn of the twentieth century monument makers frequently used mass–produced castings on which they added epitaphs and, occasionally, carved motifs. Repetition of these motifs indicates that the stonecutters were probably using pattern guides. With the opening of this cemetery, the manufacture of tombstones became a new industry for Nelson. 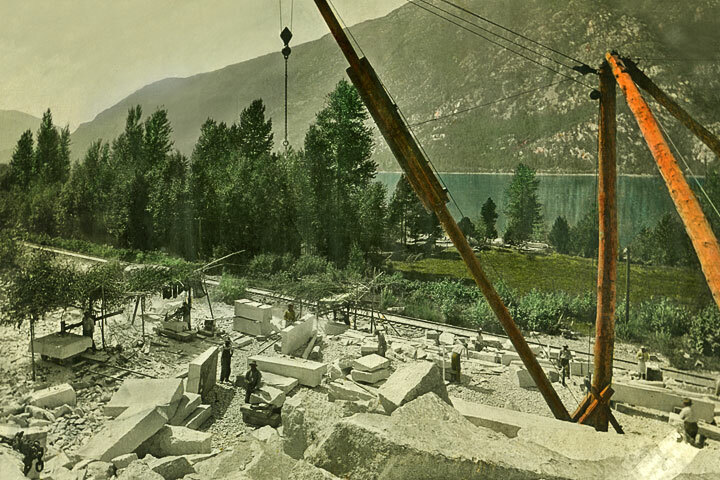 The granite and marble materials used came from various quarries located in the Kootenay region: Three Mile Point Works just east of Nelson, Kootenay Lake Marble Quarry on the east side of the lake opposite Kaslo, and Marblehead at the north end of Kootenay Lake in the Lardeau. While statuary was more than likely produced overseas, local stonecutters were responsible for carving the epitaph, erecting the statues and placing curbs. 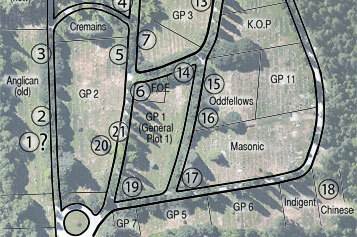 • A Google map showing the location of the cemetery within Nelson. 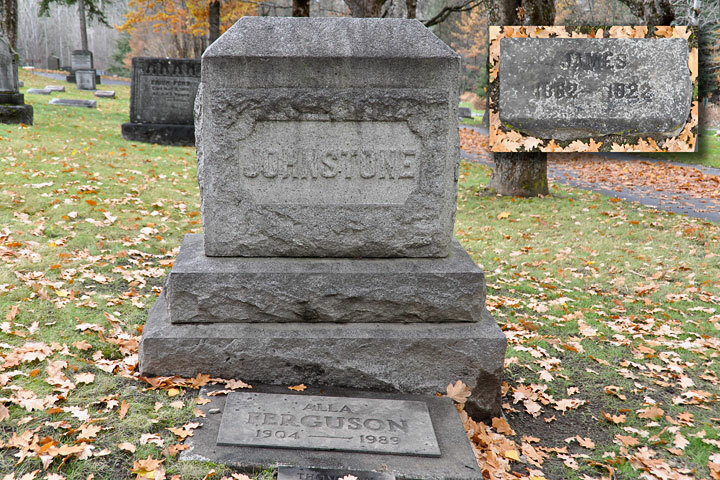 • A thumbnail link (right) showing the location of tombstones within the cemetery. Each map opens in a new window. Having the cemetery map in its own window enables it to be consulted easily while this window scrolls. The number on the map corresponds to the location in the caption. The map is oriented with south at the top, so a visitor would enter the gates at the lower left (from Falls Street). Fowler first served as a civil engineer in New York and later moved to the Black Hills of South Dakota where he worked for mining, milling and smelting concerns. In 1890 at Golden, BC he built one of the first smelters in the province. By 1896 he had moved to the Kootenay region where he earned a reputation as one of the British Columbia’s foremost mining engineers, serving as the second President of the Canadian Institute of Mining and Metallurgy (1900-01). Most of his career was spent at the Bluebell Mine in the community he named Riondel. 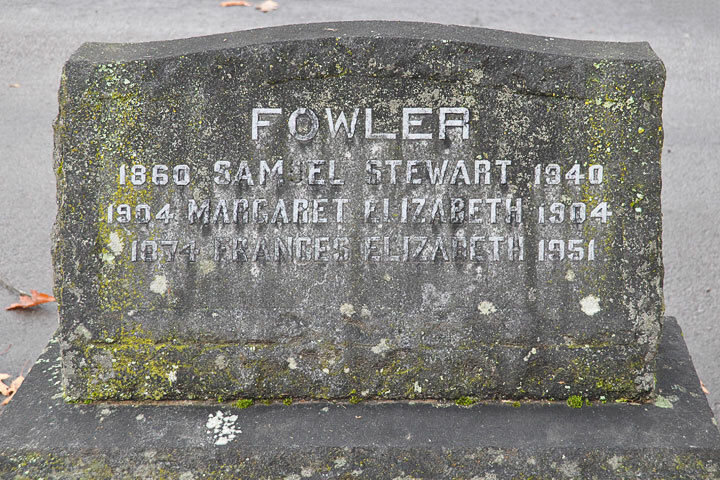 S.S. Fowler, one of the Province’s early ecologists, established a game preserve on company property and insisted on preserving the natural beauty of the mine site by prohibiting the indiscriminate cutting of trees. McLeod is credited as one of the locators of the Alberta town site of Medicine Hat. Before moving to the Kootenay, he served with the Northwest Mounted Police on the Canadian prairies. Recognized as one of the tallest men in the region, Big Rory purchased the first miner’s license in the West Kootenay. 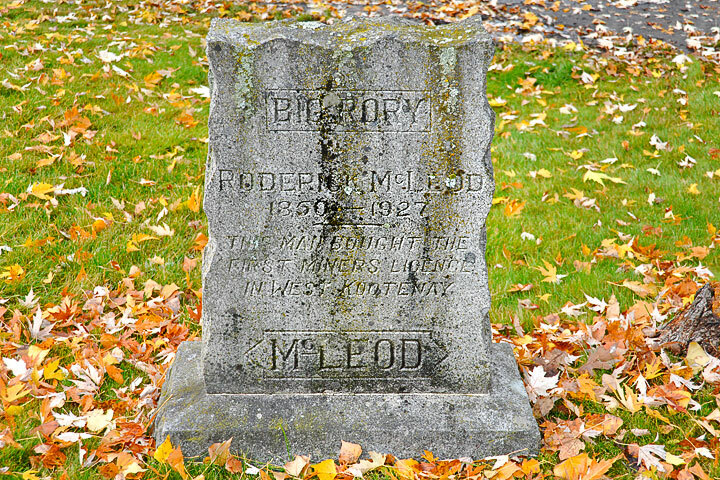 McLeod was a successful prospector in the Kokanee Glacier Park area and a prominent Ainsworth hotelier. In 1901, Matthew Aylmer inherited his title, the Eighth Baron of Belrath, Ireland, a baronage that dated back to 1662. After serving a distinguished 35–year career in the Canadian Army, Lord Aylmer retired from his Inspector General post with the rank of Major General. In order to alleviate his chronic bronchial asthma he was advised to seek a more favourable climate, so he purchased 10 acres of land, sight unseen, at Queens Bay on Kootenay Lake. 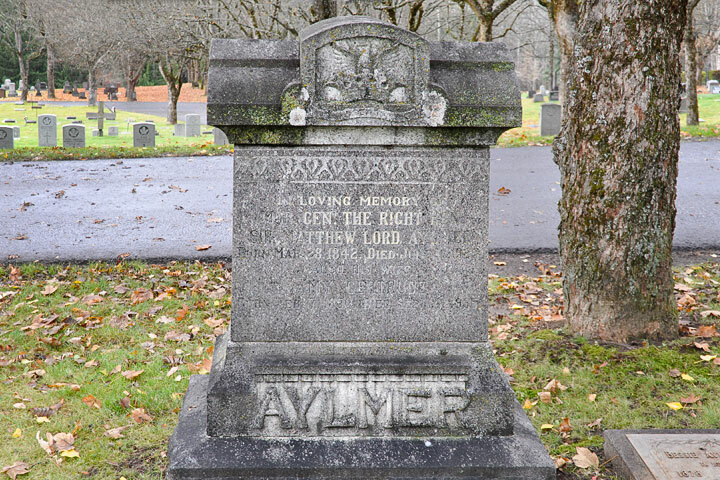 By 1909 Lord Aylmer and his wife migrated from Ottawa with their five adult children. Upon arriving at the desolate site, the young Aylmers tried to persuade their father to move on to Victoria and to abandon his dream of establishing a fruit ranch. 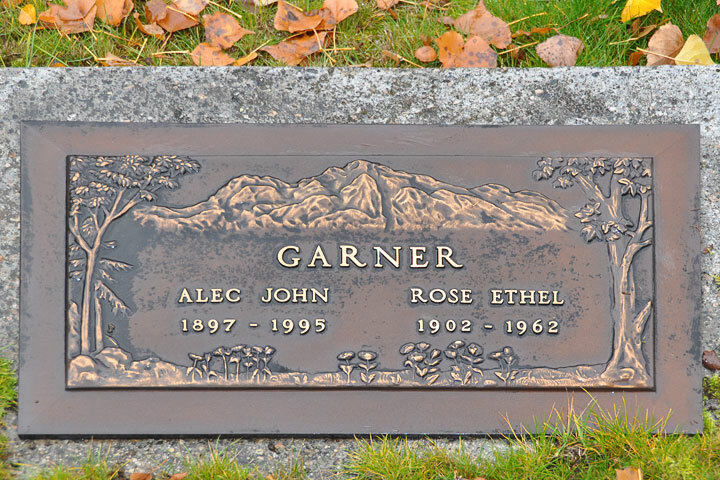 He refused, persisted, and over the years the Aylmers grew to love their home in the Kootenay. In her youth Amy Gertrude was acclaimed as a talented pianist who had played before royalty. She was the daughter of Hon. John Young, Lower Canada statesman and Chairman of the Montreal Harbour Board, who married Lord Aylmer in 1875. Lady Aylmer was also an accomplished gardener and once won first prize for the best amateur garden in Ottawa. Aside from her obvious talents, Lady Aylmer was a modest individual who did not participate in many activities outside the family. 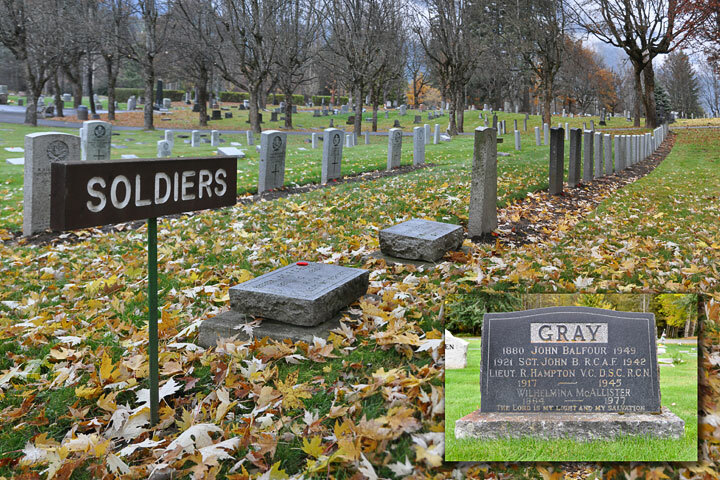 Military plots consist of uniform gravestones arranged in regulated rows where individual identity is surrendered to the larger national cause. Unfortunately many young Canadian servicemen buried in Nelson survived the war but lost their battle against tuberculosis. These Great War veterans were treated at the Balfour Sanatorium, previously the C.P.R. Kootenay Lake Hotel that served as a military hospital for tuberculosis patients between 1917–1920. During The Second World War, 73 young men from the Nelson district lost their lives and most of them were buried on foreign soil. Double tragedy devastated the Gray family when Flight Sergeant John (Jack) Balfour Jr. was the first Nelson casualty in 1942 and his older brother Lt. Robert Hampton (Hammy) was the last Canadian serviceman to be killed in action when his navy aircraft was shot down by Japanese warships at Onagawa Bay on 9 August 1945. He posthumously received the Victoria Cross, the British Commonwealth’s highest honour for valour. The ultimate sacrifice made by these servicemen who fought for freedom and democracy should never be forgotten. Riesterer immigrated to Canada around 1870 and established his first brewery in Victoria, BC. A second brewery in New Westminster was destroyed by fire and his third, the Mainland Brewery, was constructed in the False Creek area of Vancouver. He then moved to Nelson and opened his fourth facility on Latimer Street in 1894. Riesterer’s Brewery, using only the best–imported malt and the finest Washington hops together with exceptionally pure water, produced 500 gallons of lager beer per day. This pioneer brew master’s product was “pronounced by connoisseurs to be equal in flavour and keeping qualities to the best beer made in Canada and the United States.” By the time of his death Riesterer was considered one of Nelson’s most enterprising citizens who had established the best brewery in the Kootenay. As a young man Pisapio immigrated from Italy to New York and then gradually worked his way west. As was often the case, he adopted a nickname, Mike Scally, for general usage. Scally arrived in Nelson by 1896 and for five years served as a labourer and then construction foreman for the C.P.R. With $60 capital and his good name as credit, he opened a grocery store in 1901. By the time this pioneer merchant retired and sold out in 1926 the business was worth over $60,000. For many years while in the grocery business, Scally served as labor agent for a variety of large employers in the district, particularly the C.P.R. Thanks to his position, many Italian immigrants found work and successfully settled in the Kootenay. 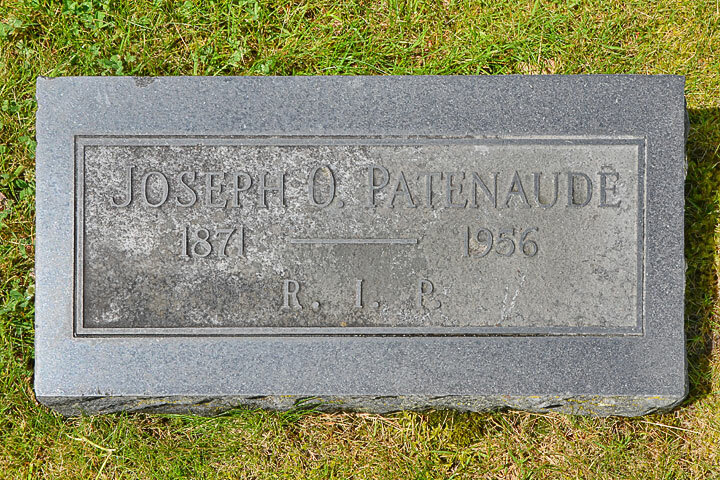 On 6 October 1897, en route to the Klondike Gold Rush, Patenaude, impressed by the spectacular view of Nelson from the Great Northern Railway’s Mountain Station, immediately detrained and within one month had started his optometry business. He continued to operate it from the same location until his retirement in November 1950. During that time his business expanded to include jewelry making, watch making and watch repairs. Uncle Pat, a bachelor, was truly a gentle man and a genuine benefactor. As an advocate of the silver mining industry he was thrilled to have the government produce a silver dollar. To celebrate this minting he counter–stamped silver dollars with “J.O.P.” from 1935-49. These coins are now rare collectables. After receiving his education at Louvain University’s American College in Belgium, Father Althoff was ordained in June 1878. He immediately left for the Diocese of Vancouver Island and in May 1879 was appointed to Alaska as its first and only Catholic missionary priest. He later wrote that “the Alaska years were singularly free from all that seems worth telling. It was lonesome, lonesome, lonesome in a superlative degree.” After Father Althoff left Alaska he served in the Victoria cathedral parish for a number of years until transferred to Nelson in 1902 where he found a parish deeply in financial arrears. Using his own personal, inherited wealth he helped to reduce the debt and under his capable administration the parish flourished. 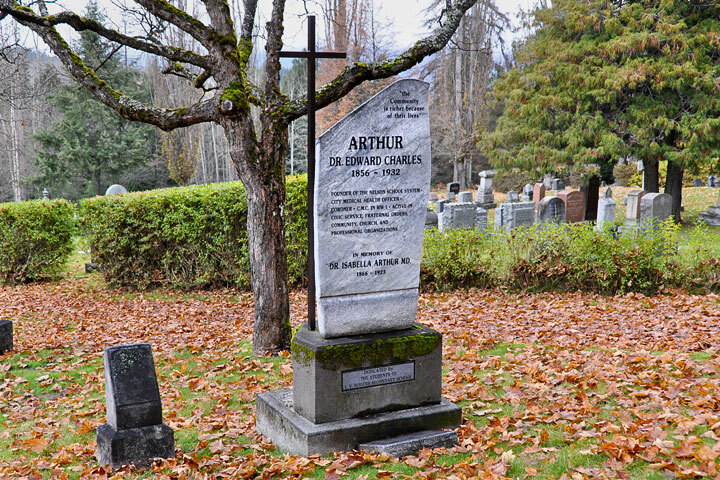 He was appointed Vicar–General (VG) of the Archdiocese of Vancouver in October 1911. Although Very Rev. Monsignor Althoff “loved his pipe and hated a cheap cigar next to mortal sin,” he never hesitated to provide for others and assist those in need. His unassuming demeanour, kindness and generosity particularly to the sick and poor are fondly remembered. At the age of six Niven was sent to Glasgow, Scotland to receive his education. By his early twenties he had made his first trip to Canada to seek a healthier climate. He worked in sawmills, railway camps and in Nelson as a freight handler for the C.P.R. before returning to Scotland by cattle boat. Niven wrote a series of articles about his adventures for a Scottish newspaper and this ultimately led to a successful journalism career. Around 1908 he began to write novels in his spare time. After his marriage in 1911, he returned to Canada as a freelance writer; but with the outbreak of war he was recruited by the British Ministry of Information. After the war he returned to Canada for a short rest, but ended up settling just east of Nelson at Willow Point on Kootenay Lake. It was here that his career as a novelist flourished, resulting in 33 books of fiction, two of verse, many articles and short stories. Niven's works received regular, favourable reviews and the British Book–of–the–Month Club selected several of his novels. 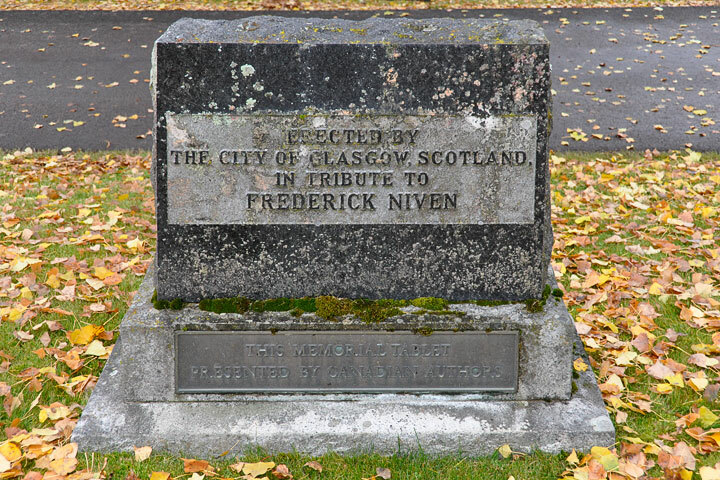 At a ceremony in July 1946, the City of Glasgow erected this memorial headstone and his colleagues of the Canadian Authors Association, a memorial tablet. Shackleton, Simpson and Company, marble cutters and contractors, constructed at least six historic buildings in Nelson. Prior to coming to Nelson in 1898, Simpson and his father–in–law, William Shackleton, worked as stonecutters on the Parliament Buildings in Victoria. 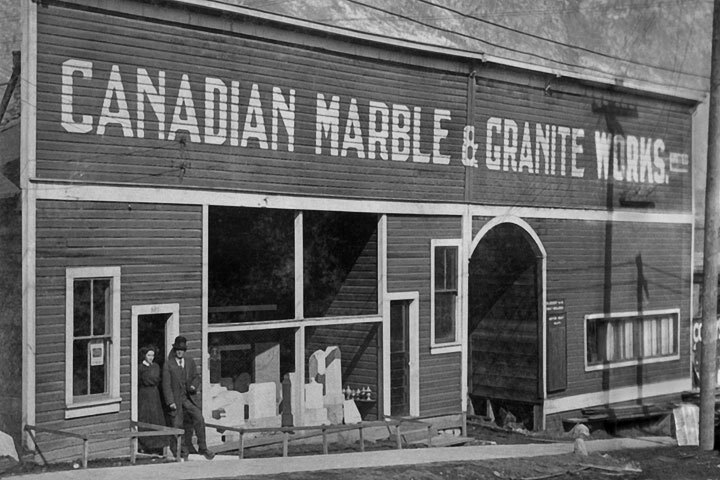 In Nelson they established their own company and, at various times, became proprietors of the Kootenay Marble Works, Canadian Marble and Granite Works with its quarry located at Marblehead in the Lardeau, and the Kootenay Lake Marble Quarry on the east side of the lake opposite Kaslo. 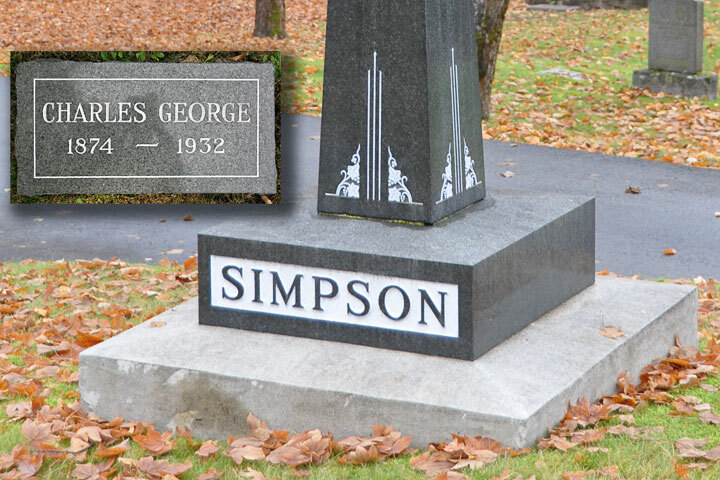 Their company cut many of the contemporary granite and marble cemetery monuments, including Simpson’s memorial obelisk. b. 8 August 1860, Jacksonville, New Brunswick; d. 6 February 1935, Nelson; Section: I.O.O.F. At the age of seventeen Hume was advised to go west for a healthier climate where in 1882 he worked as a professional hunter supplying buffalo meat to the railway construction camps. Soon afterwards he began his merchandising career, serving in at least six Kootenay communities. To ensure an all–Canadian supply line he co–founded the Columbia River Transportation Company with its fleet of sternwheelers. His Nelson business began in a tent in 1888 and when it was closed years later over $30,000 was owed to him in grubstake money. 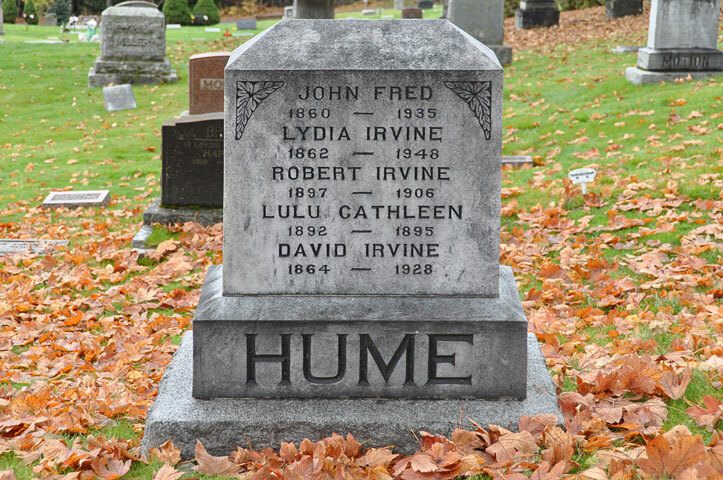 When Hume decided to run for the BC Legislature as a candidate for the West Kootenay riding in 1894, a friend commented: “Fred, you can't speak worth a damn but you will be elected because everybody likes you!” He devoted himself to provincial affairs for six years and while serving as Minister of Mines he oversaw passage of the controversial amendment to the Metalliferous Mines Inspection Act (1899) establishing the eight–hour working day. In the fall of 1898 he opened the magnificent Hume Hotel that, although drastically altered, still is a Nelson landmark. A typical Nelson pioneer, Hume actively supported many organizations including: Nelson Board of Trade, Nelson Oldtimers Club, Nelson Curling Club, Kootenay Lake Launch Club, Nelson Rowing Club, Nelson Rifle Club and the Kokanee Mountaineering Club. b. 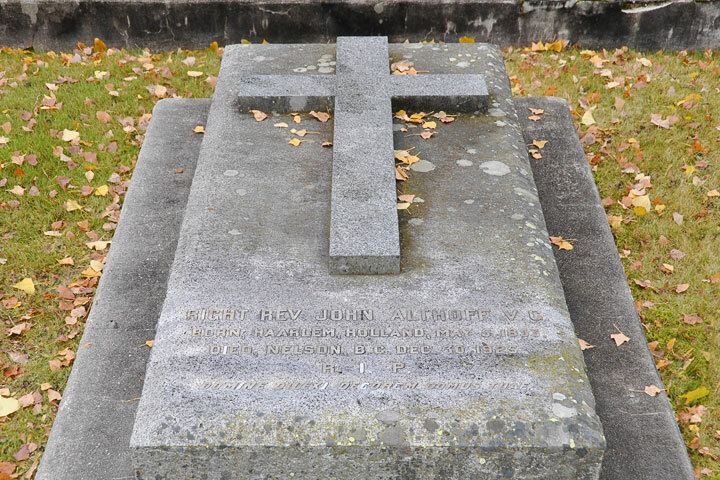 29 November 1856, Picton, Ontario; d. 6 July 1932, Nelson; Section: I.O.O.F. After graduating with Bachelor and Master of Arts degrees, Arthur taught school for a number of years and then entered medical school. After graduation in May 1888, he headed west and served as physician for the Canadian Pacific Railway Company. Dr. Arthur arrived in Nelson on 12 August 1890 and not only began his medical practice but also opened Nelson’s first drug store. As an ardent supporter of education, a room in his house served as Nelson’s first school in 1891. In that year he was appointed District Coroner and by 1895 served as Medical Health Officer for the city at $25 per month and for the district at $50 per year. After the school system was established, Dr. Arthur served as a school trustee between 1892–1912. As a founder and active member of the University Club of Nelson, he proposed to the Provincial Government (1907) and to the University Site Commission (1910) that a provincial university be established with endowment lands and that it be located in Vancouver at Point Grey, the present site of the University of British Columbia. One unforgettable Kootenay personality was a Glaswegian Irishman who had a propensity for drink. When under the influence, in a rich bass voice with a thick brogue, he sang unlimited verses of The Gunner from Galway—hence his nickname. Although Devlin made several fortunes as a clever promoter and owner of mineral claims, he spent them just as quickly. Humorous anecdotes of his escapades, true or exaggerated, abound. 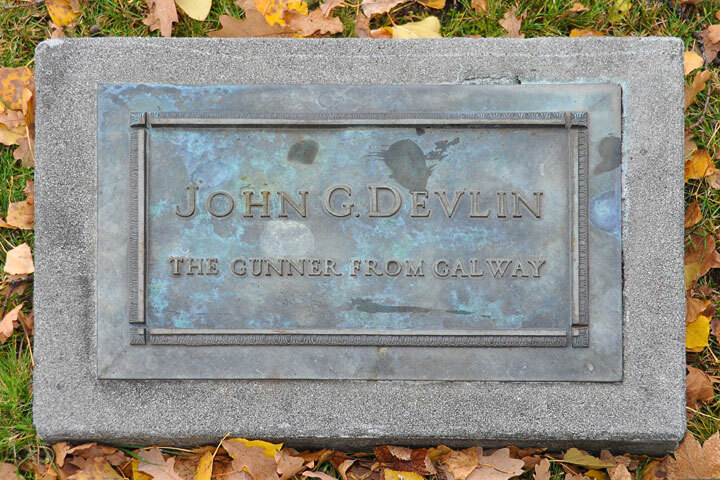 On one occasion Devlin chartered a train coach, sleeper, diner and baggage car with complete crew—and travelled from Revelstoke to Montreal holding a champagne party all the way thereby making an impressive entrance to Montreal for the benefit of his Eastern investors. On another occasion he celebrated a bit too much so was put in jail to sober up. Upon release in the morning he appeared to be even more inebriated than when he entered! It was discovered that a hot water bottle, once filled with whiskey, was strapped around his waist with an easily accessible tube leading down his sleeve to his wrist. When he passed away at 59, the coroner’s autopsy indicated alcoholism as the cause of death. There are few early graves in this section possibly because it was customary to return the bones of the deceased to China for burial beside those of their ancestors. 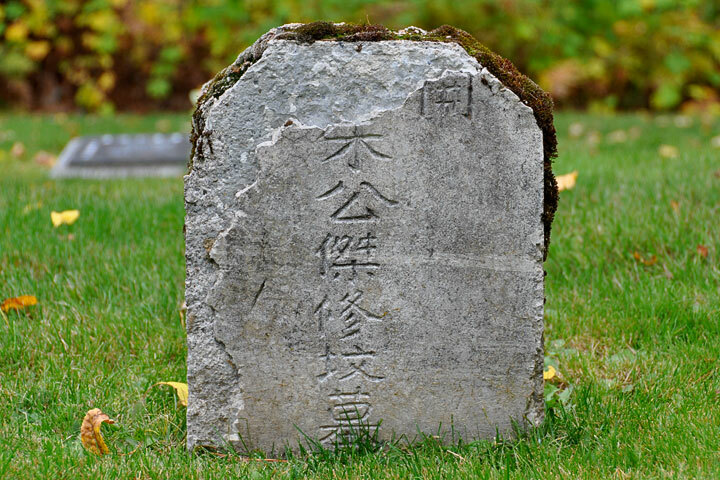 Although this site was assigned in 1898, the first Chinese burial recorded in the cemetery register was for the interment of Mar Yoke on 8 January 1904. Although semi-isolated in the northwest corner of the cemetery, it is not known if this location was selected using the 3,500–year–old practice of Feng Shui that is based on physical and metaphysical chi (qi). A good site is oriented to the four compass points and includes the elements of nature and the four seasons. The purpose of this orientation is to promote good harmony and balance for the deceased and the surviving family members. Ideally North, the realm of the reptile, is bounded by water and mountains representing winter; South, the realm of the Phoenix, is open to the sun representing summer; East, the domain of Yang (male) symbolized by the dragon, faces wood representing spring; West, the domain of Yin (female) symbolized by the tiger, includes cliffs representing autumn. 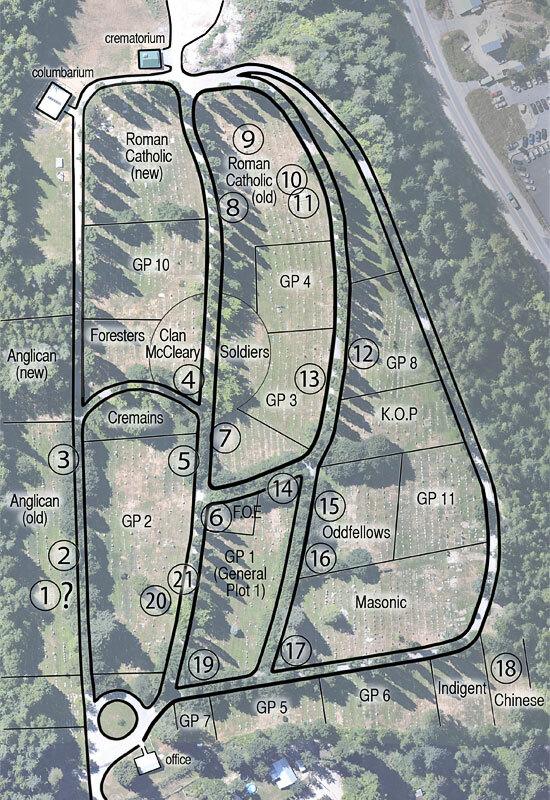 Whether by accident or design, all of these criteria are present at the Nelson cemetery. After graduating from Aberdeen University, Johnstone came to Canada in 1881 and began working for the C.P.R. as a civil and construction engineer. He later worked for the Crows Nest Pass Coal Company in Fernie and then in Nelson. However, fruit growing fascinated him so he switched to the business of horticulture. The Johnstone fruit ranch located directly across the lake from Nelson helped to put the West Kootenay on the map as a fruit growing area. Winning five medals from the Royal Horticultural Society in London, England and two medals at the 1915 World Exposition in San Francisco, California increased his fame. 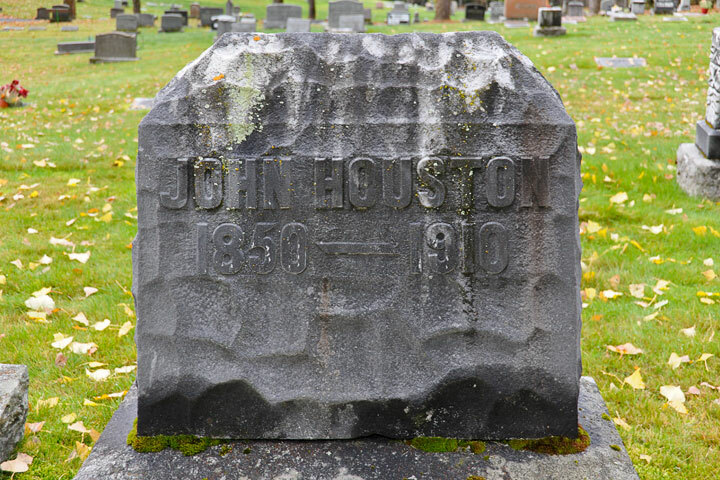 Johnstone was a strong advocate of the back–to–the–land movement and a firm believer in diversified farming. He made his own ranch self sustaining by producing meats, poultry, eggs, butter, cheese, fruits, vegetables and grains. He served as president of the Kootenay Fruit Growers’ Union, British Columbia Fruit Growers’ Association as well as many other local and provincial organizations. I beg you: read this tragic episode of my life. It may prevent you from the delusion into which I fell due to naivety of my youthful years, when I was fascinated by the idea of communism. However, soon I realized my error when I saw deceit, violence, oppression, terror. I soon abhored [sic] atheism, spiritual and physical slavery, brutal tyranny, that indiscriminately annihilates millions of innocent people for their homage to principles of truth, faith in God, love and freedom. For these ideals the Red butchers took the lives of my father, brother and mother. And how many of these fathers, mothers, sons and daughters, as blood-stained corpses are being buried in mass graves in Ukraine, my motherland, and wherever the state power is being usurped by communists. History will never accept all the millions of these martyrs. Brothers and Sisters! Living among you in Canada, I was delighted to enjoy the rights of freedom and democracy. For me, who suffered tortures, Siberian concentration camps, and who only by a miracle escaped the claws of despotism, life in Canada was an unimaginable happiness and a true paradise.